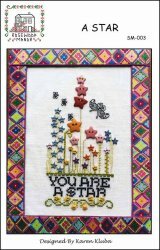 A Star [D6729] - $32.00 : Yarn Tree, Your wholesale source for cross stitch supplies. Cross stitch chart from Rosewood Manor. Do you have a little girl in the family who's dreams are of magical things?!?! "A Star," would be a perfect design for her to hang in her room. Blue, pink, purple & yellow star button embellishments are the flowers. Butterflies flutter above the flowers, creating a magical feeling as you look at this design. "You are a star," is stitched below the stars. The star button embellishments are included with this design. Dream big little one, dream big. Stitch count is 54 x 96. Stitched on #2181 Zweigart Belfast Linen 32ct. Antique White.